Pundits offer a number of reasons for our current economic crises. Many point to the greed of Wall Street as the single cause of our market troubles; others point to the housing bubble and sub-prime mortgages as the culprits. While these are certainly significant factors, there are also less talked-about causes: as a nation we have forgotten the tangible value of insightful design and skillful manufacturing; of vision, daring, and showmanship. In short, we have forgotten what those who founded our profession knew. The idea for this paper began with a puzzling question: how could industrial design not only come into being, but thrive during the Great Depression? In 1929 the stock market crashed, many banks closed their doors forever, fortunes were lost and unemployment skyrocketed to twenty-five percent. In the midst of this distress, American industry took a chance on a new profession, Industrial Design, and the Industrial Designers delivered. The 1930s saw the birth of a new style, streamlining, brought to life by Industrial Designers like Norman Bel Geddes, Raymond Loewy, Henry Dreyfuss, Harold Van Doren, Robert Buddlong, John Vassos, and Peter Muller-Munk. While these names are familiar to us, many are unaware of the thoughts and deeds of these early designers, whose wisdom and resourcefulness not only built a new profession in the midst of the worst economic crisis in our nation’s history, but improved the lives of everyday people. As the first style available to the masses, it inspired them, providing a view of the future--one filled with optimism and excitement. So what is streamlining? In a book entitled Industrial Design, published in 1940, industrial designer Harold Van Doren quotes the Oxford Dictionary in describing streamlining as “that shape of a solid body which is calculated to meet with the smallest amount of resistance in passing through the atmosphere.” (Van Doren, pp.138-139). He goes on to identify two different types of streamlining: functional streamlining, and borrowed streamlining. Functional streamlining is most often found in transportation design: trains, airplanes, cars, and boats. Borrowed streamlining occurs when the form principles of functional streamlining are applied to slow moving or non-moving objects. Some scholars have identified the German architect Erich Mendelsohn, who designed the Petersdorff Department Store, as the earliest user of streamlined style (Wilson, et al. p. 57). Streamlining 1While the Petersdorff Department Store and sketches for industrial buildings done by Erich Mendelsohn foreshadow the principles that will be used in the streamlined architecture of the 30s and 40s, they are not the first instances of streamlining. Likewise, in recent years some scholars have incorrectly identified streamlining as “American Art Deco,” or described it as “art deco turned on its side.” (See Streamlining 1) While streamlining does have elements in common with art deco—most notably the use of rectangular, vertical, or horizontal stripes—the origin of streamlining and the resulting details are much different than that of art deco. C Streamlining 4ompare the streamlined Baby Brownie camera (Streamlining 2) with the decorative art deco elements of the Beau Brownie (Streamlining 3), designed by Teague (circa 1930). The Beau Brownie makes use of lines as well as circles and rectangles to establish visual direction and composition. If one were to remove the elements, the form would remain the same. In contrast, the Baby Brownie (also by Teague) has vertical stripes that are integrated into the form as well as radii on the corners and edges. This technique of integration is characteristic of streamlining. Moreover, the organization of these lines and the curvature of the form suggest movement and speed. Several authors point to the introduction of streamlined trains, such as the Burlington Zephyr, at the 1933-1934 Century of Progress World’s Fair in Chicago, as the first instance of streamlining (Streamlining 4). Streamlining 5Streamlining does have its origins in the need to reduce drag, but this was not a new idea in the 1930s. In fact, a patent had been issued almost seventy years earlier, in 1865, to a Unitarian Minister named Samuel L. Calthrop of Roxbury, MA, for the design of a streamlined train to “lower the resistance of the train as it passes through the atmosphere” (Streamlining 5.) If the idea was around in 1865, why did it take so long to catch on? Part of the answer lies in the convergence of a number of factors at the turn of the 20th century. The most important of these was the invention of the airplane by the Wright brothers, and the first powered flight in 1903. To achieve flight, the Wright brothers had to understand the principles of drag as well as lift. The diagram in Streamlining 6 shows the relationship between form and atmospheric resistance. Streamlining 6On the left side of the diagram we see that rectangular forms generate more turbulence—and therefore more drag—than teardrop forms. With this realization, the principles of decreased wind resistance had a practical application, and the race was on to understand which forms provided the least amount of drag. 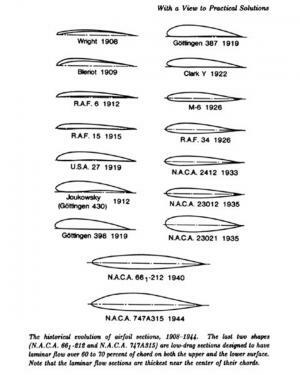 Streamlining 7Streamlining 7 shows the rapid changes in wing design from 1903 to 1933. This interest began to be translated into other forms of transportation. The refinement of the shape of the airplane wing is an example functional streamlining, where the intent is to develop forms which have decreased wind resistance and thus improve the efficiency and performance of the product. So how did we get from airplane wings to the streamlined trains and products of the mid-to-late 1930s? Part of the answer is that the demands of the automobile industry had stimulated the development of materials and material processes. In 1910, there was one automobile for every 184 people in the United States. By 1930, there was one car for every five people (Meikle, p. 7). The cost of the car had dropped from $850 in 1913 to $290 in 1924. From 1919 to 1929, the purchasing power of the average American worker had also risen by about 20 percent. These factors combined to create an increasing demand for products. The demand for products, particularly in the automotive industry, drove a number of improvements in materials and processes during this time. The introduction of continuous roll sheet steel and of high pressure hydraulic stamping presses came about in large part because of the pressure to increase production and lower costs in the automobile industry. These innovations provided a method for producing compound curves in metal objects. This new method was faster and more accurate than casting or forging. The new process used less material, and since large quantities were being made, it was also much cheaper. 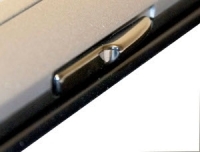 There were several additional innovations during the second decade that would contribute to the streamline aesthetic. One was the discovery of cost-effective ways to extract aluminum, turning it from a precious metal to a commodity by 1916, at about 18 cents a pound. Another was the refinement of a process for extracting chromium and the development of cost-effective methods of electroplating. The development of chromium extraction processes led shortly to the combination of chromium and steel, thereby creating stainless steel. During this time-frame, plastics and richly colored, durable enamel and painting techniques also came into wider use as product components. This last was driven, once again, by the car companies, particularly the Chevrolet Division of General Motors. Chevrolet had determined that it would never be able to beat Ford on cost, so in 1926 it introduced new styling and bold colors. Ford responded by expanding its colors from black to black, green, and maroon. 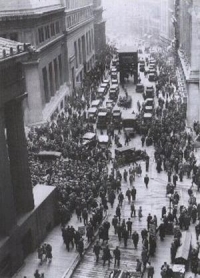 Streamlining 8On October 29, 1929, the stock market crashed. By noon, all of the market gains of the last year were gone. By four in the afternoon, nearly $10 billion in market value was lost. Unemployment quickly rose to over 25 percent. Over 9,000 banks failed during the Great Depression, and for a while, all of the news was grim (Streamlining 8). Two years before the depression, the first industrial design office was opened by Norman Bel Geddes. According to most sources, Walter Dorwin Teague, already a successful illustrator, added “industrial design” to his letterhead in 1927. Teague’s first client, according to Industrial Designer and design historian Carroll Gantz, FIDSA, was Eastman Kodak, who began paying him a $15,000 retainer fee for his industrial design services in 1927 (Gantz, p. 69). By 1928, Donald Dohner, John Vassos, Peter Muller-Munk, Donald Deskey, and Russel Wright had also entered the field. Either late in 1928 or early in 1929 Raymond Loewy, a successful fashion illustrator, established his industrial design firm. About this time, Henry Dreyfuss and Harold Van Doren also began their careers as industrial designers. Now there was a profession that could apply the new materials and techniques to consumer goods. The depression was, perhaps, the single most important contributing factor to the development of streamlining. Companies were forced to take risks, at a time when a new profession was emerging to provide them with guidance. The profession itself had gotten off to a rather bumpy start in the late 1920s. There was still a lot of confusion between industrial artists and industrial designers. Often the solutions they provided to industry were not capable of being produced with current tooling, were too costly to produce, or were dangerous to the user. In a 1934 article entitled “Both Fish and Fowl,” published in Fortune Magazine, George Nelson related the story of a refrigerator design that made use of a foot petal to open the refrigerator door. The result, according to Nelson, was a “housewife, balancing on one foot, is caught off balance by the heavy door, sent to the floor with her dishes” (Nelson, p. 43). The designers that were hired to change the look of a product often stayed to make practical improvements to the product design and the methods of production. This was the point of transition from mere decorative artists to professionals concerned not only with appearance, but with production costs and product use as well. This combination provided industry with solutions which were practical, cost-effective, and beautiful. Streamlining, both functional and borrowed, provided a common aesthetic thread for many of the products produced during the 1930s. If one subscribes to streamlining as an aesthetic as well as a practical approach, certain form qualities rapidly emerge—for example, rounded forms are better than angular forms. In the case of borrowed streamlining Harold Van Doren provides a clear example of how the principles of functional streamlining can be easily borrowed for non-transportation products. Streamlining 9 Streamlining 10If you take a teardrop shape, rotate it 360 degrees about its horizontal axis, and then slice it, you have one of the basic forms for streamlining (Streamlining 9). 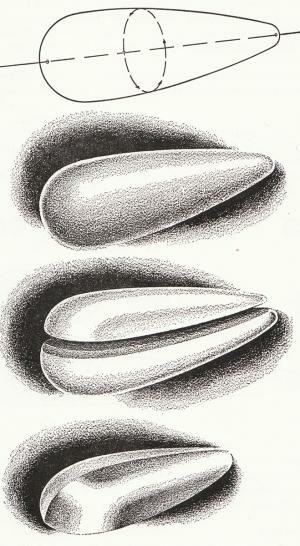 Most streamline objects have a number of shared stylistic characteristics: the use of chrome, stainless steel, or aluminum; the presence of bright colors, enamel, or plastic parts; forward- or rearward-leaning shapes; aerodynamic shapes (teardrop shapes or shapes derived from teardrop slices with rounded edges and corners); and a frequent use of what many designers called speed lines, lines which were, typically, horizontal stripes or lines used to reinforce the idea of speed or movement (See Streamlining 10). The new designs were dazzling, unlike anything that people had experienced before, and they hit the market at a time when the vast majority of people were downcast and fearful of the future. Streamlining showed them that the future could be bright. Not only were the products attractive, they often were more convenient to use, and more considerate of the user. The Loewy cream separator, for example, was not only beautiful; it was more easily cleaned and maintained, because it did not have any sharp corners that would trap milk. The new profession also pushed clients to adopt new methods of manufacture; new ways of thinking about production and assembly. According to George Nelson, some manufacturers were reluctant to work with Norman Bel Geddes because they were afraid that his ideas would catch on and it would render their current plants obsolete thereby costing them millions of dollars. Geddes, for his part, claimed that the purpose of his staff was to prove the radical practical. 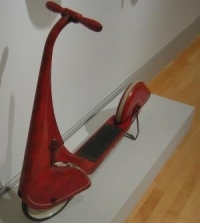 Though they pushed their clients to adopt new materials and methods, the early industrial designers were also keenly aware of the need to make products affordable and practical to produce. Donald Dohner, for example, when designing a vacuum cleaner, found a way to save Westinghouse $40,000 in tooling cost while switching from metal to plastic. The resulting vacuum was lighter, quieter, less expensive, and more beautiful than its all-metal predecessor. When contracted to redesign a locomotive, Dohner found out that locomotives were “run for the most part by fat men. Riding the [rail] road pounds the kidneys out of a skinny man. So passages must be designed for fat men to pass through, parts to be oiled must admit fat shoulders, levers and wheels must be spaced for fat hands.” (Nelson, p. 88). This type of practical observation and keen attention to detail was a common trait among early successful industrial designers. Another common attribute was showmanship. Bel Geddes described an occasion where he was trying to convince his client that they were producing too many different models. Bel Geddes was advocating that the client, Standard Gas Equipment, go to a modular design, which would allow the company to make a wide variety of configurations using a small number of modular parts. The client remained unconvinced, so Bel Geddes called the client over to his office for an emergency meeting. In preparation for the meeting, Bel Geddes had made wooden blocks, in half inch scale, that represented each of the stove parts in the client’s current stove line. Bel Geddes then scattered the blocks over the floor of his office. When the client entered the office, he stubbed his toe on the blocks and after swearing at Bel Geddes, came to the same conclusion: Standard Gas needed to reduce parts by adopting a modular approach. The Standard Gas Equipment project cost the client $50,000 against future royalties and took a year to complete, in the midst of the depression (Nelson, p. 42). Streamlining 11This balance of convincing clients through showmanship and sometimes through out-and-out stunts, while at the same time attending to issues like production cost and ease of use in far greater detail than the client had ever considered, was typical of the early industrial designers. Involving designers gave the client better products at a better price. While the founding fathers of design had many traits in common, there were a number of differences both in approach and with respect to the proper use of streamlining. According to Nelson, Bel Geddes, often cited as the “father of streamlining,” was embarrassed by the title because streamlining was being applied to objects which did not require it; objects like scales and pencil sharpeners. Other designers, such as Van Doren, were unapologetic about using “borrowed” streamlining. He reasoned that if it meant that the consumer would find a product more appealing and would therefore purchase it instead of a non streamlined product of similar function, then the borrowed streamlining had served a very practical purpose indeed. But what has become of streamlining? It has become a permanent part of our form language. While it goes in and out of style, streamlining is ever-present in form details both large and small (Streamlining 11). What can we learn from the designers who used streamlining? In looking at the early designers, and the development of streamline design in particular, we see how design can inspire and lift a country in difficult economic times; how it can reenergize manufacturing while at the same time providing useful, fun, and responsible products. Designers once again have the opportunity to shape the future in larger-than-life ways. We need to help guide our clients to more responsible environmental policy and a sustainable use of resources in a way that is profitable for the client and beneficial for the consumer and the planet. We need to be a major force in figuring out how to produce products in a cost effective way at a high quality and, whenever possible, creating value-added jobs in the United States—jobs which grow our economy through the development and production of products. As in the Depression, clients will often not entertain these ideas willingly at first, but if we recall the lessons of the pioneers of our profession, who through their passion, daring, vision and work, played a significant role in helping American companies survive the Great Depression, we too can leave a large and positive legacy. Nelson, George. Both Fish and Fowl, Fortune ,1934. Van Doren, Harold. Industrial Design. New York: McGraw-Hill Book Company. 1940. A second edition of this book was published in 1954. Wilson, Richard Guy; Pilgrim, Dianne H.and Tashjian, Dickran. Machine Age in America: 1918-1941. Brooklyn: Brooklyn Museum/Harry N. Abrams.1986.